As the school nurse, I am always on surveillance and work closely with the Department of Health on monitoring what is happening in our community. It is helpful for me to know what symptoms your child is experiencing when the child is called out sick. Please call and/or email the secretary, the teacher and the nurse by 9AM the day the child will be out. This will help with the communication process as well. You will need to call/email each day the child is out. *****The state of NJ is still at a HIGH level for flu! Please keep your child home if there are signs or symptoms of illness!!!! Strict handwashing is recommended, frequent wiping of surfaces and objects, and observe personal space. The secretary and/or the nurse will call to check on the whereabouts of a child who is not called/emailed out for safety reasons. Again, as the nurse, it is helpful for me to know what symptoms your child is experiencing. Your child should eat breakfast each day before school. One of the main reasons students are seen with the complaint of headache or stomachache is due to hunger. Please provide enough food for snack time as well for sports. On half days, the cafeteria is not open, so please send food. We need to know that every child is safe! Please call the attendance line before 9:00 AM and leave a message whenever your child is absent or late for any reason. Illnesses such as the common cold, minor sore throat or cough can be managed at school. Your child should be kept home if there is a fever of 100 degrees or more, vomiting or diarrhea. Temperatures should be normal for 24 hours (without the use of fever reducing medicines) before the child returns to school. Please notify the school nurse if your child develops a contagious illness or condition such as Strep throat, pink eye, chicken pox, head lice, impetigo, etc... Refer to the last page of the Parent Handbook for information on contagious illnesses, restrictions and exclusion from school. Please do not send medications to school with your child. All medications, including over-the-counter, must be given to the school nurse in their original container and be accompanied by a physicians order. A parent/guardian signature is also required. The only medications students are allowed to carry with them and/or self-administer are those medications needed for potentially life-threatening illnesses such as inhalers for asthma and an EpiPen for severe allergic reactions. A student may carry these medications only when the prescribing physician has given written authorization that the student may carry the medication. Medications must be renewed at the start of each school year. Medication listed on the Emergency Form and approved by the School Doctor can be administered with written consent of a parent/guardian. Cough Drops may be sent to school with your child. A note from the parent must accompany the cough drops, giving the school nurse permission to dispense them to your child. There will be a temperature check every time there is a request for a cough drop. One drop will be given in the morning and one in the afternoon only. AFTER THREE CONSECUTIVE DAYS OF TAKING THE COUGH DROPS, they will be sent home/discontinued. A doctor’s note will need to be sent to the health office in order to continue dispensing cough drops to your child. It is important that the school nurse be able to reach a parent/guardian in the event of illness, injury or an emergency. Updated information is obtained at the beginning of each school year. If the information changes during the course of the year, please notify the office. 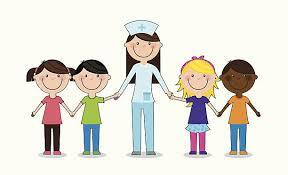 Inform the school nurse of any changes in your child’s health status. Examples include: a new diagnosis of asthma, recent sprain/fracture, pediculosis (lice), or recent hospitalization.